Stephen Colbert is in Philadelphia this week to film his PA primary-centric version of "The Colbert Report" and is ingratiating himself with the local animals quite nicely. 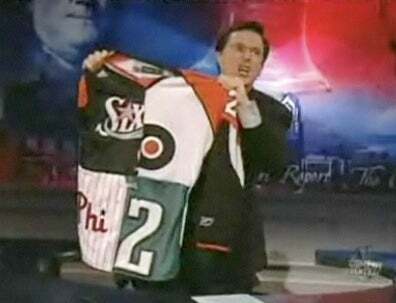 Last night, he showed off this multi-teamed jersey that would surely be a big hit with some of the more ardent and more fashionably inclined Zubaz'd faithful. Of course, these jerseys will be on the racks at Philly-area Modell's Sporting Goods within the next week. Just in time for prom season.